Eye catching form excellent for Foundation, Border, Mass Planting, reaching 24-48" tall without pruning and about the same wide. Maintains it's interesting colors all through the summer. 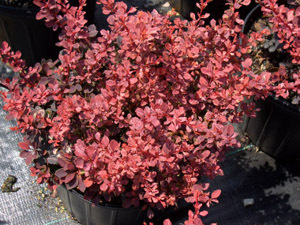 Juvenile foliage emerges a rosy pink color and will turn a crimson-burgundy as it matures. A constant change of color! Best color in full sun. Tolerates dry conditions. Good choice for an informal hedge. Also good for medium tall borders and accent plantings. Will not get out of control.